Arianespace continued Ariane 5’s track record of success with another heavy-lift mission performed today from the Spaceport in French Guiana, which orbited a pair of telecommunications satellites for Latin America: Intelsat 30, which is hosting the DLA-1 payload; and ARSAT-1. Both spacecraft were deployed into geostationary transfer orbits following their ascent from the Spaceport’s ELA-3 launch zone, with Intelsat 30 released nearly 28 minutes after liftoff, and ARSAT-1 separating approximately six minutes later to complete the flight sequence. Flight VA220 was the 76th launch for Arianespace’s Ariane 5, which operates from the Spaceport in French Guiana. Ariane 5 delivered an estimated total liftoff performance of 10,000 kg., including its two passengers and hardware for the launcher’s dual-payload deployment system. 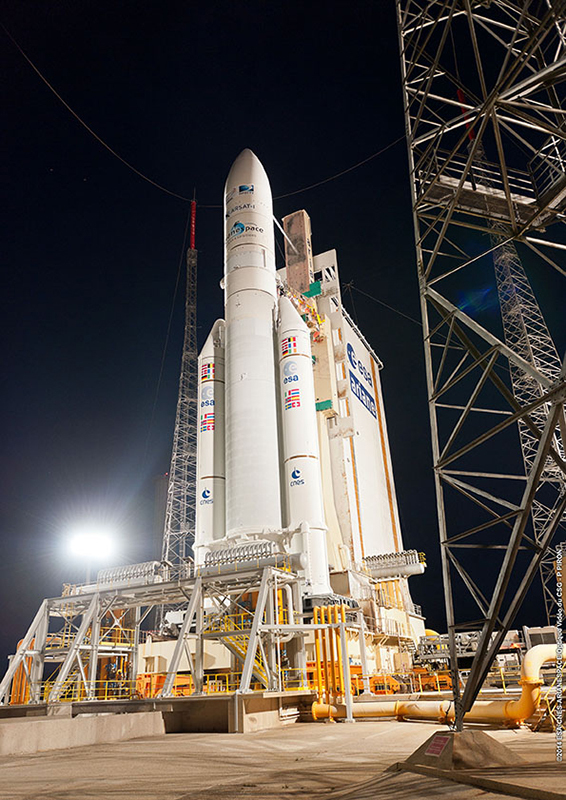 This mission was the 220th launch of an Ariane-series vehicle since its introduction in 1979, and the 62nd consecutive success for Ariane 5 – as well as its 76th flight overall. “The two satellites orbited tonight will serve users located in Latin America, a region that has always had a special place in the heart of Arianespace, because this is where our launches take place, and also because our market share in the region has always exceeded 50 percent,” said Arianespace Chairman & CEO Stéphane Israël in post-launch comments at the Spaceport. Israël added the recognition of Arianespace’s launch services quality, reliability and experience was demonstrated once again by today’s mission, which was performed at the service of two established global telecommunications players – Intelsat and DIRECTV – as well as for a new regional operator – ARSAT (Empresa Argentina de Soluciones Satelitales Sociedad Anonima). Intelsat 30, released first from Ariane 5’s upper passenger position, is a high-power relay spacecraft built by SSL (Space Systems/Loral) for Intelsat. Based on the 1300-series satellite platform, it hosts the DLA-1 payload for DIRECTV. With a design life of 15 years, Intelsat 30 will be co-located with Intelsat’s Galaxy 3C satellite at 95 deg. West – from which it will expand direct-to-home entertainment offerings in Latin America, as well as provide backup and restoration services. Intelsat 30 is the 54th satellite launched by Arianespace for Intelsat, as well as the 45th SSL-produced relay platform – continuing a 31-year relationship between these three companies. Arianespace also has orbited six satellites for DIRECTV, including Intelsat 30 and its DLA-1 payload lofted this evening. Ken Lee, the Intelsat Senior Vice President for Space Systems, acknowledged Arianespace’s “impressive professionalism and skill” for this Ariane 5 launch, which he described as vital and important to his company. The second payload deployed by Ariane 5 on today’s mission – ARSAT-1 – is the first geostationary satellite built in Argentina. It was produced for ARSAT by the company INVAP, with Airbus Defence and Space and Thales Alenia Space serving as leading equipment suppliers. As the first satellite to be launched by Arianespace for ARSAT, ARSAT-1 will operate from an orbital position of 71.8 deg. West and will deliver a wide range of telecommunications, data transmission, telephone and television services across all of Argentina, Chile, Uruguay and Paraguay. The Argentinian government’s Secretary of Communications, Norberto Berner, hailed Arianespace’s mission success as a historic day for the country, which will create opportunities for its citizens by opening up new communications services. Najat Vallaud-Belkacem, the French Minister of National Education, Higher Education and Research, noted the importance of Arianespace’s launch services on both a European and global scale. She said France supports the continuation of Europe’s launch services leadership – especially with upcoming decisions on the next-generation Ariane 6, which will further strengthen the company’s competitiveness. With today’s success, Arianespace has conducted nine launches from French Guiana in 2014, comprising five Ariane 5 flights, three missions with Soyuz and one Vega liftoff – a pace which keeps the company on track to meet its 2014 target of 12 missions, based on the availability of payloads scheduled for these launches. Arianespace’s Stéphane Israël said the company’s three remaining scheduled missions for 2014 are a lightweight Vega flight on November 18 with Europe’s Intermediate eXperimental Vehicle (IXV) spaceplane, an early December liftoff of Ariane 5 with the DIRECTV-14 and GSAT-16 relay platforms, and a medium-lift Soyuz launch with a cluster of O3b Networks connectivity satellites.